A Texas sheriff says he could throw the book at a driver over his limited vocabulary and dislike for President Trump. 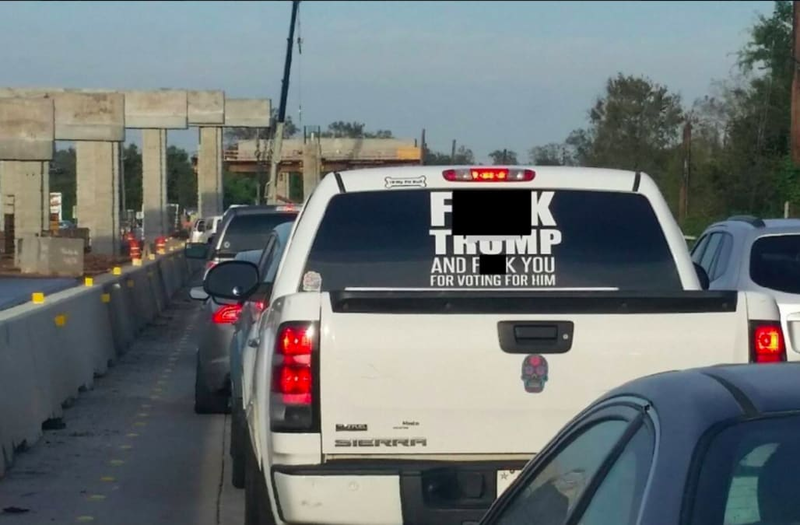 “F--- Trump and f--- you for voting for him,” reads the sticker on the back of a GMC Sierra broadcast via Facebook by Fort Bend County Sheriff Troy Nehls. What the message lacks in wit it apparently made up for in offense, with Nehls saying he had received “numerous calls regarding the offensive display” from citizens hoping that the driver’s foul mouth and truck can be washed clean by the law. The sheriff southwest of Houston put out a call for information, saying that a prosecutor had already told him that she could bring disorderly conduct charges. Social media commenters almost immediately took issue with the local lawman’s assessment, suggesting that Nehls could infringe on the driver’s free speech. The U.S. Supreme Court in 1971’s Cohen v. California said that a law on disturbing the peace violated the Constitution when it was applied against a man who wore the phrase “f--- the draft” on a jacket. Despite the supposed traffic jam of calls to the sheriff’s office, there have been no reports of people so incensed by the truck’s message that they resorted to violence that may actually require police attention. Karen Fonseca told the Houston Chronicle that her husband owns the truck, which has been pulled over by officers who could not find a reason to write a ticket.